Check out Varsity Scoreboards' popular wall-mounted scoreboard. This 4-foot-by-2-foot-by-4-foot scoreboard is effective for organizations on a limited budget and for small to mid-size basketball, volleyball and wrestling programs. The scoreboard features 6-inch super-bright 100,000-hour-rated LED displays. The clock counts up/down to 99:59 maximum and scores go from 0 to 99. Includes bonus, possession and period indicators, operator's keypad with control cable, and built-in horn. A wireless remote control is available. Varsity Scoreboards' model 2207 also is easy to install and operate. Boardware Software turns your IBM-compatible computer into an alphanumeric scoreboard that can be projected on your pool wall. Driven by IST's Meetware, Timeware, Poloware or Workware, Boardware gives you an easy-to-read display with 32 characters per lane line and a scrolling header line. Boardware is recommended for pools with minimal or no natural light. It requires a computer with Windows 98 or better, a projector with sufficient lumen rating to show a bright image at the desired location, and a theater-style screen surface for the best display. Santech of Clearwater, Fla., offers a new line of scoreboards incorporating full-color LED displays with live video. They are computer-controlled using spread-spectrum RF, fiber optic or twisted pair cable. These scoreboards are reasonably priced and can be fully customized for minimal additional cost. Since 1988, Santech's goal has been to provide its customers with exactly what they want. Through continuous improvement, Santech scoreboards are easy to install, simple to operate and extremely reliable. 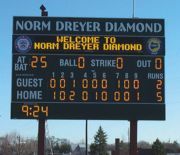 Hit a homerun with a baseball scoreboard from Daktronics. To meet the needs of any facility, Daktronics offers more than 20 models of baseball scoreboards and an endless array of display additions from which to choose. The main scoreboard provides vital game information, but it is the scoreboard enhancements that integrate seamlessly into the facility and make the most impact. Daktronics has introduced a series of cost-effective, standard decorative accents to bring major-league excitement to hometown fields. You can display game statistics and communicate stadium information by adding a Galaxy® LED message center to your scoreboard. Complete your ballpark with a Model 9120 Baseball Scoreboard from Spectrum. This 7-foot-high-by-20-foot-wide scoreboard features digital counts for balls, strikes and outs as well as home/visitor line scores that automatically accumulate to the total. Choose from a wide variety of colors and mascots. Standard features available at no additional charge include extras like border striping, captions in colors and your team name in place of "home." Make an impact and add a video display, message center, spirit/sponsor signs or programmable team names. An innovative leader, Spectrum delivers the highest quality scoreboards that are reliable and easy to operate. Introducing UltraScore, the new portable scoreboard from NEVCO. Ultra light (17 pounds) and Ultra portable (3 foot by 2 foot by 2.5 inches). UltraScore is ultra versatile, with adjustable brightness levels for outdoor/indoor use. A segment timing feature is ideal for practice drills. The convenient hand-held remote control operates on two AA batteries and includes a belt clip. UltraScore is powered by a re-chargeable battery, with six hours of use on a single charge. The remote control and re-chargeable battery are included and store inside the scoreboard when not in use. Built-in carry handle/hanger included. Effective for recreational leagues, Fair-Play Scoreboards' 1600 basketball series displays all basic game information as well as additional features such as timeouts left and double-bonus arrows to indicate one- and two-shot fouls. Three distinctive digit colors organize scoring information and ensure readability. Sports fans, athletic directors and administrators have relied on the style, performance and innovation of Fair-Play Scoreboards to stay on top of their game for 70 years. Check out Fair-Play's entire line of basketball scoring and timing products.